Wow, it is Tea Tuesday already! 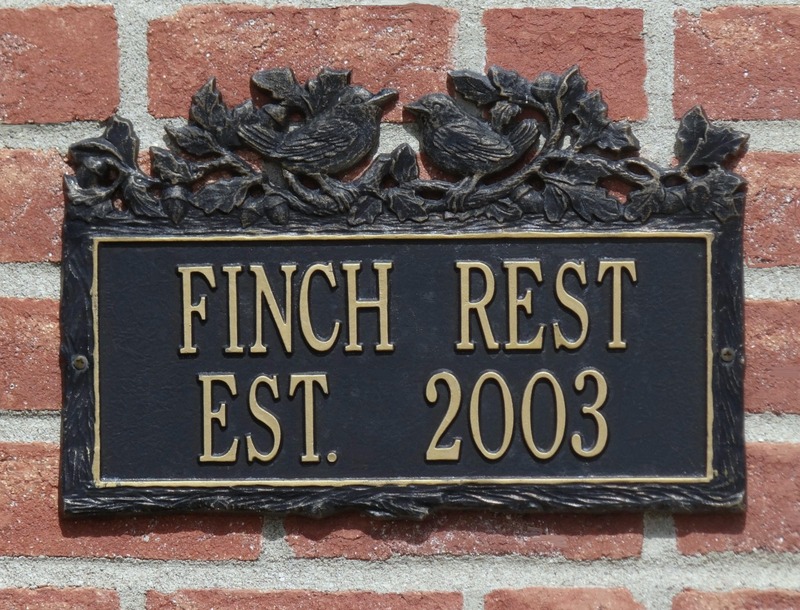 Where does the time fly? 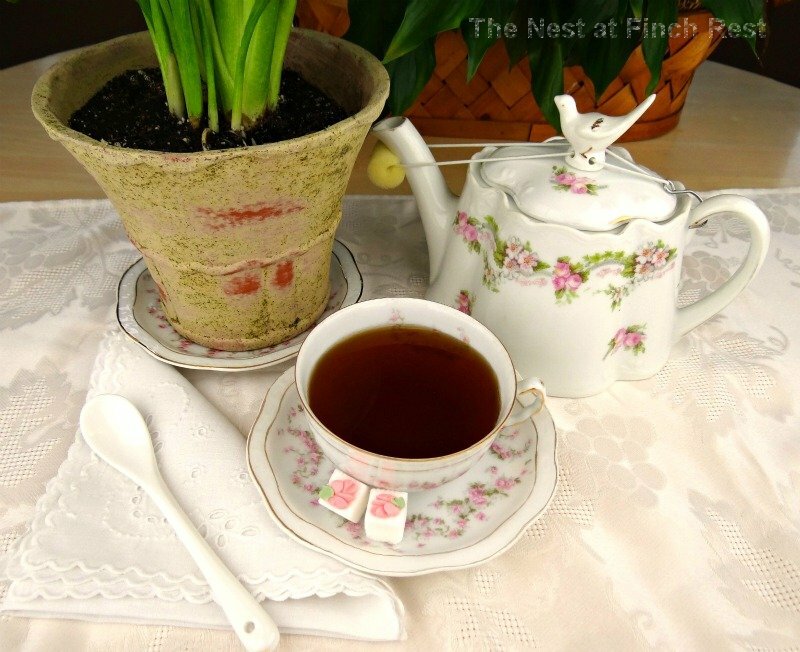 I prepared a pot of tea in colors to show off my pretty pink Easter Calla Lilly. I love the stoneware pot it came in- pink, green and beige. My sister MB brought this pretty plant as a thank you for staying with us for a few days for Easter. What a lovely plant! Love the teapot an teacup. A lovely pattern! Thanks for linking to Tuesday Cuppa Tea! How beautiful, Michele! What a great looking pot, too. Love those sugar cubes! I noticed that special thing attached to your tea pot...to keep the lid on while pouring? (I've never seen anything like it.) 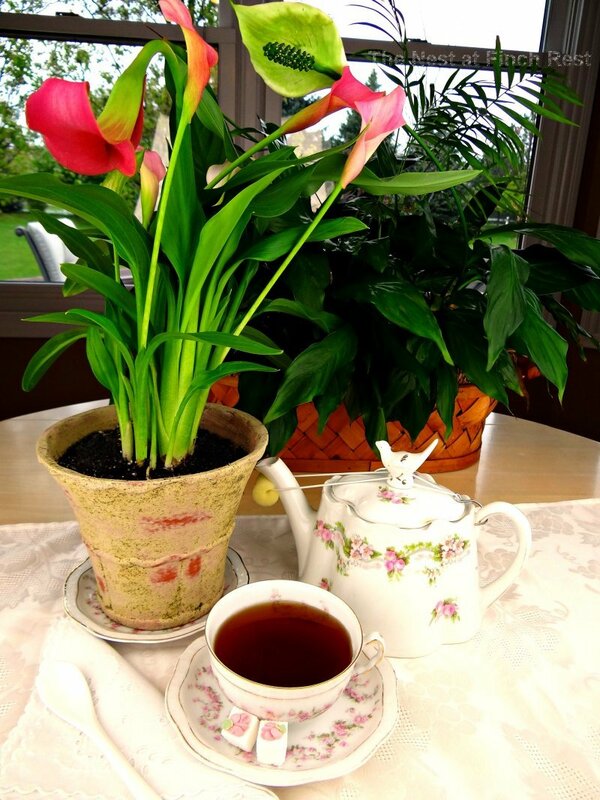 Beautiful flower in a lovely pot...a nice way to enjoy a pot of tea. It is called a Drip Catcher. It also holds lids on, but its main function is to protect guests and linens from tea stain drippage!!! It's my fav one, a bird, of course. Oh my, what a sweet teapot and teacup! Love them both and the sweet sugar cubes! I would love to take a peek in your china cabinet, girly. Then again, maybe not! Thou shalt not covet, Sandi! LOL! Thanks for joining me for tea, my friend, and enjoy your week. Oh I do love your tea pot with the little birdie on top! Oh my I love it! 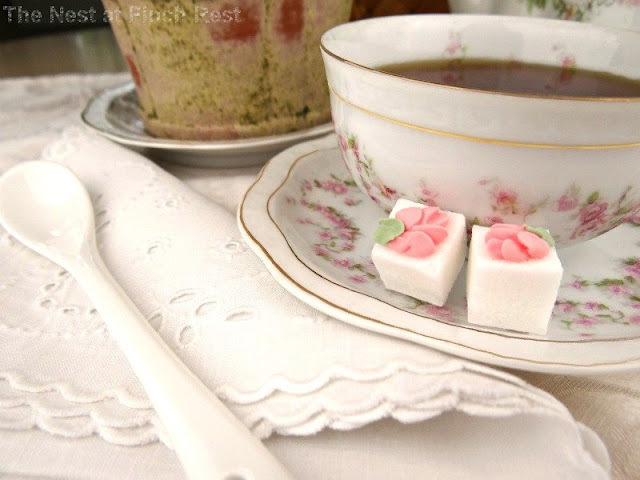 The tea cup is so lovely too, sitting there with beautiful sugar cubes. What a gorgeous setting. Such a pretty teapot and a beautiful lily. Thankyou too dear friend on commenting on my newest post. Boy are you fast. Like less than 30 minutes. It means alot and I love your sweet words. 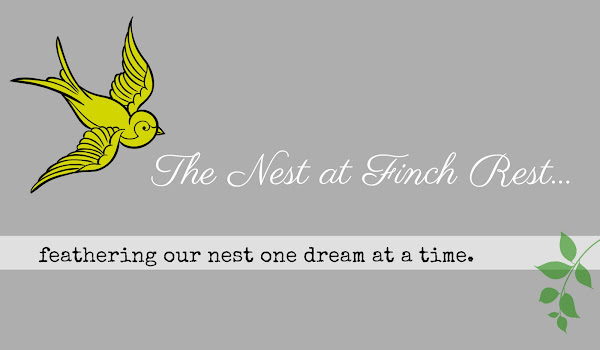 How are things at the Nest? Good I hope! You are certainly beautifully outfitted for tea. Your lilies are lovely. (You asked about my granddaughters... I have a dozen! Aged three to twenty-one.) Glad to know you stopped by! Have a great week! What a charming teapot and cup. I love the decorated sugars next to it. 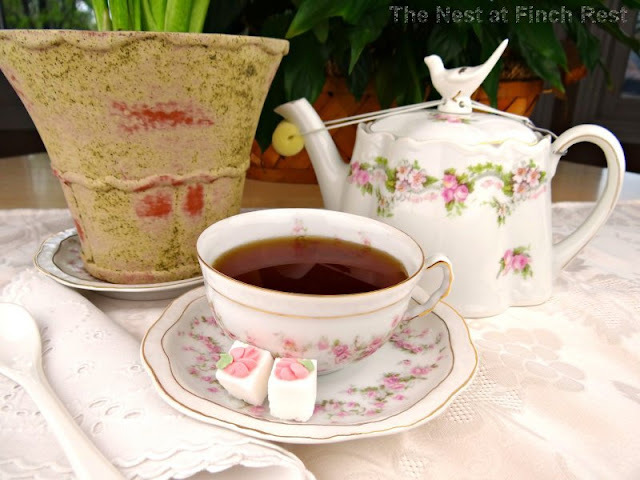 I would love a cup of tea right now, and the Lily is beautiful too! Thanks for your comment today. Would love for you to post on Simple & Sweet Fridays. Have a great week. You teapot and teacup are so pretty. Thank you for sharing and have a lovely day. I'm so in love with your pretty teacup and matching teapot! You have truly set a beautiful table with your gorgeous Calla Lily plant. oh.my. I ♥ those sugar cubes!!! They are adorable :) I am learning so much from visiting all these blogs, and yours is one of the prettiest and most inspiring! Thanks for sharing your lovely tea party for one! Hi there, Michelle...I have the same bird on top of my teapot! Glad you had a nice Easter....please stop by for a cup of Persian Tea!